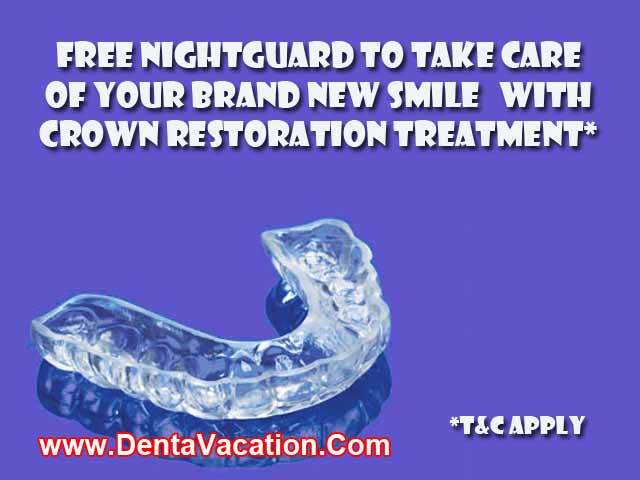 Lowest priced dental crowns in Algodones. Save almost 70% over treatment prices in the United States and Canada! *The above mentioned prices are subject to change without any prior intimidation. We advise you to fill in the quote-form on the right for the latest special offers and package prices. If you’re looking for affordable yet quality dental crowns, then Los Algodones in Mexico is a viable destination to consider. The competitive dental crowns prices in this quaint Mexican border town attract droves of dental tourists who are fed up with the high price tag of dental work in their home country. Many fans of dental tourism in Mexico are making return trips to maximize the savings they get from great price discounts offered by numerous dental clinics there. 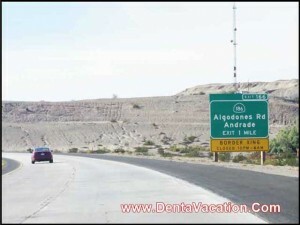 They can also get awesome deals with dental veneers and dental implants in Los Algodones. 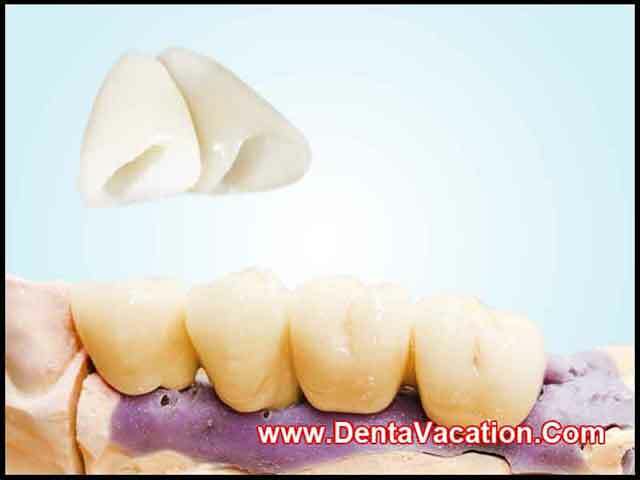 Dental crowns are used to restore and protect a damaged tooth, to keep a dental bridge intact, to cover a severely discolored or misshaped tooth, or to cap a dental implant. People with severely damaged tooth may need a root canal treatment first. Getting a low-cost tooth crown is useless if you do not practice proper oral hygiene afterwards. Avoid chewing a gum using the covered tooth. Avoid directly biting on hard foods like apples and carrots, which could break or dislodge the crown. When flossing, slide the floss out instead of lifting it out, which could pull off the crown. 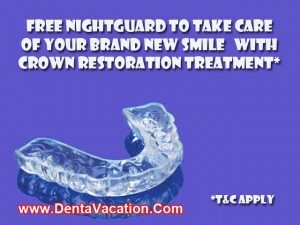 Get a FREE nightguard for any dental crown restoration treatment. Terms and Conditions apply. Limited-time special. Where will My Dental Work be done? Check out this video in which a staff member talks about international patient services at Algodones clinic. Does the Clinic have Accredited Dentists? Yes. The clinic has board-certified dental doctors who have trained at prestigious institutions such as the Harvard School of Dental Medicine in Boston and the Loma Linda University (LLU) in California. Does the Clinic Accept Insurance? Yes, even if the clinic does not directly deal with your insurance provider it will help you in all the required paperwork for the reimbursement of your money. As of March 31, 2015, a fee of US$30 is charged for the service. Can I be under Sedation During the Procedure? Yes, the clinic does offer nitrous oxide or IV sedation services. Let us know your preferences so that we can arrange for them prior to your treatment. Does the Clinic have Parking Space? Yes, the clinic has its own parking lot just a couple of blocks from the border crossing. Clinic patients can park their vehicles free of cost. How Far is it from the Border? The clinic is just seven miles west of Yuma, Arizona and only a couple of blocks from the Andrade Port of Entry in California. Can You Suggest Any Hotels? We can arrange your stay at Hotel Hacianda – Los Algodones. It is a full-service hotel with all the modern amenities. Our clients can get rooms for as low as $35 a day. What about Pick-up and Drop? We offer FREE ground transportation between the dental center, border and the hotel. Compared to First World countries, dental crowns cost 40% to 60% lower in Algodones. Affordable dental work in Mexico is particularly important for many uninsured Americans. According to the National Center for Health Statistics, 1 in 4 Americans below 65 years of age lacks dental insurance (from the report, “Dental Insurance for Persons Under Age 65 Years with Private Health Insurance: United States, 2008). Going to a Los Algodones border dental clinic is very convenient for American patients. Those from neighboring US states can further cut down their travel and accommodation expenses and travel time as they can just drive down to get teeth crowns in the Mexican border city. It is only about 7 miles from Yuma, Arizona. Despite the low dental work costs, patients can just sit back and relax, knowing they’re getting high quality treatment at leading dental clinics in the city. Teeth restoration here is all about quality minus the expensive price tag. The great savings can also be spent on a relaxing vacation in Mexico. Andrade is the official US-Mexico border crossing here open from 6 am to 10 pm. You can plan your trip to coincide with a festival in the border town to make your vacation more fun and eventful. However, be warned that prices tend to go up during peak seasons. It has a warm, dry climate which is why many older tourists from the US and Canada spend their vacations here to escape the cold wind back home. You can sample authentic Mexican dishes like tamales and tlayudas. However, make sure to dine in reputable and clean restaurants only. Affordable fees, high-quality of care, highly-competent and English-speaking dentists, and wonderful places to see are more than enough reasons why getting dental crowns in Los Algodones – Mexico can make a patient smile. For the best prices and more information on Dental Crowns in the border area, fill-out the estimate-request form on the right.